That one game you just keep going back to. Picture the scene. We’re back in 2014 and I’ve just got my hands on a brand new, shiny Xbox one. The future is quite literally IN MY HANDS. Once the system has been lovingly connected, all the setup tutorials have been waded through, and I’ve had my 5 minutes of fun with Kinect, I launch the game that came bundled with the system…. Titanfall. Fancy graphics, smooth framerate and the novelty of Mech mechanics (spoiler: I love that term!) quickly give way and expose the game’s true nature: It’s another multiplayer shooter. Sighing, I exit after my second match and haven’t been back on since. I just don’t get on with competitive mulitplayers! Fortunately, Guacamelee: Super Turbo Championship Edition! is on the Xbox Live store, and heavens be praised, it’s free via games with gold. A quick download later and I’m bathed in Mexican music and presented with a crisp, clean platformer! This was my first true experience of the next generation, and I don’t regret it for a second. I missed the original version of Guacamelee, released a year earlier on PS3 and Vita, so while others were comparing notes about the new inclusions, I was free to take the whole thing in as an original experience. Often referred to as a “Metroidvania” – a mix between nintendo classics Super Metroid and Castlevania – you control Juan. A Mexican farmer trying to rescue his kidnapped girlfriend. Juan dies in act 1, but is given the power of a the Luchador mask and is resurrected – kind of. He must journey through the land of the dead to find his girlfriend and defeat the big nasty, Carlos Calaca. The game is written with tongue firmly in cheek, with a likeable cast and a fantastic backdrop, which looks even better on the Xbox One. Juan learns his super powers (special moves) from a goat, and fast travels using giant statues. You’ll travel through towns, countryside, temples and jungles. Once you acquire the ability to swap between worlds, the entire landscape is redrawn at the touch of a button…. it’s really impressive! Side missions have you herding chickens and trying to get ingredients together for Fajitas… Even the combat is enjoyable, with various grapples and throws available to you right from the get-go, with well-disguised tutorials to teach you the ropes. Every time you get a new power, it feels liberating. It’s another weapon in your arsenal, but its also another reason to revisit all those areas you couldn’t get into before , in search of gold coins or health/stamina upgrades. 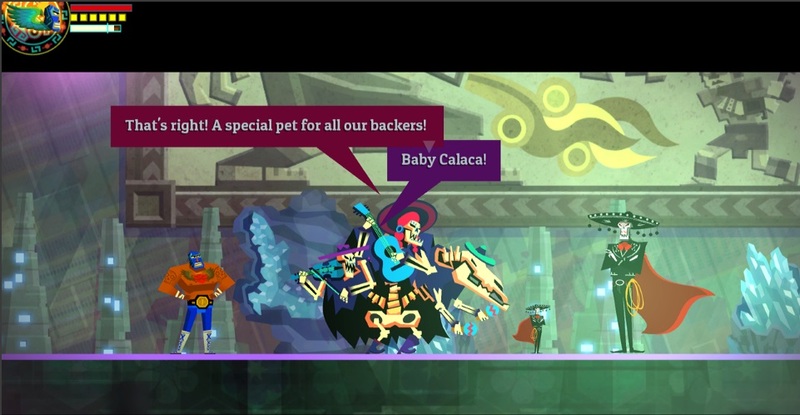 As the game goes on, you begin to realise that Drinkbox, the team behind Guacamelee, are an evil, EVIL bunch. Jumping puzzles, with split second timing become more and more common, you may have to use your powers and/or switch worlds at a second’s notice. The variety of enemies constantly changes too. The game thinks nothing of suddenly walling you into a room with no escape and a myriad of enemies with their own shields and attacks will appear from nowhere. For this puzzle, you have to drop down towards the spikes. A last minute double-jump, followed by a dashing derpderp, followed by a rooster’s uppercut. Just to get back onto the ledge! 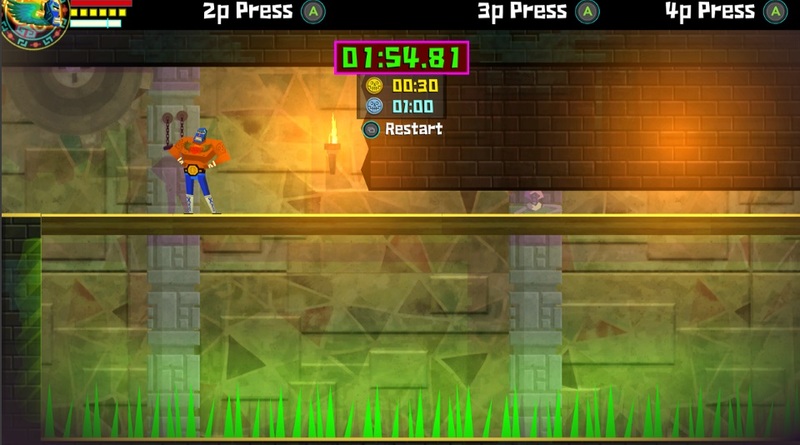 So yes, I have two gripes about Guacamelee and the difficulty curve is definitely one of them. The fact I’ve been playing this on and off for almost 2 years tells it’s own story! I’ll play for a few days, get frustrated and put this game down again, only to get the itch later and come back for more. I have a feeling I’m right near the end now and some of the puzzles are mind bending. This game includes all the DLC from the first version. It’s huge and it is a CHALLENGE! The second point is much more minor. The in game maps are confusing, and could have been a little more helpful. It’s easy to get lost or forget what you’re meant to be doing here. This is not even one of the main bosses in the game! I almost forgot to mention – this game supports up to four player co-op! I’ve not tried this yet but I’m told there’s no slowdown and it runs like a dream. I imagine this game then becomes kind of a throwback to games like TMNT and the Simpsons Arcade game. Lofty praise indeed, and one more tick in the box! 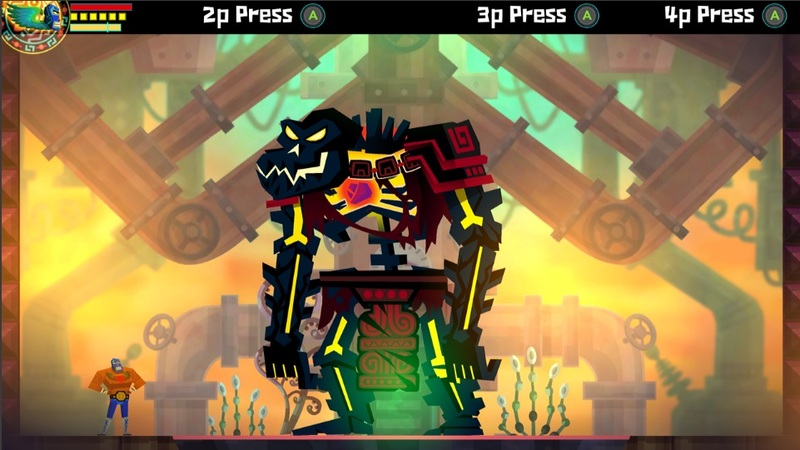 Flaws aside I can wholeheartedly recommend Guacamelee. Colourful, funny, enjoyable and as long as you don’t mind a challenge, this is excellent value for money! Posted on May 30, 2016 July 3, 2016 by itsonlyleggyPosted in Modern, ReviewsTagged Review, Xbox Live, Xbox One. Next Next post: Time to bust out the 20 pence pieces!